FNJ Chair Gaunle bats for free media - Integration Through Media ....! DAMAULI: Chairperson of Federation of Nepali Journalists (FNJ), Shiva Gaunle, has said that the press should be allowed to work without any interruptions. Inaugurating the 10th anniversary of Bhanjyang National Daily brought out from Tanahun on Sunday, he said that there should be no obstructions to press for the protection of democracy and freedom of expression. 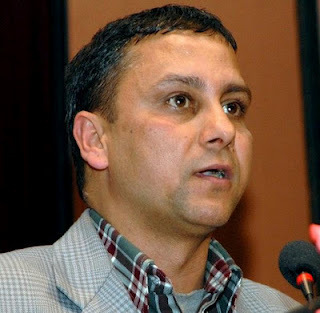 The government is maneuvering to go beyond the limitation to fence in Nepali media, he said, adding that it would in no way be acceptable to Nepali media fraternity.